Flannery’s Undertakers and Funeral Home operate a 24-hour funeral service. We are ready to meet your requirements 365 days of the year. 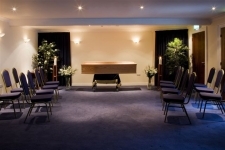 We can handle all aspects of the funeral arrangements, as well as providing assistance with after care services. We aim to lighten your burden in every possible way through this difficult time. 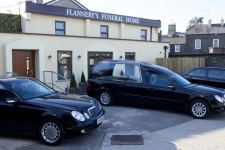 Flannery's new funeral home at Bachelors Walk in Wicklow Town is now open. The new funeral home is located within 10 minutes walk of all the churches in the town and is the only funeral home located within the town boundries. The funeral Home is set in its own courtyard area which will provide privacy and is facing the Leitrim river and the tree lined Bachelors Walk. Flannery’s are the oldest established funeral service in Wicklow town and was established in 1987 when Kanes funeral service was purchased on the retirement of Edward Kane. Flannerys has served the community of Wicklow town and all the surrounding areas since then. In 2001 William Doyle joined Flannerys as the Principle Funeral Director. Flannery’s are members of the Irish Association of Funeral Directors (IAFD) and adhere to all their codes and practices. The IAFD are the only representative organisation for funeral directors in Ireland. We are located in Bachelors Walk, Wicklow Town. Our full contact details are on our Contact page.